Following a difficult race at this years’ London marathon, I was left with a want to prove a few things to myself. I needed to know that I have the ability to pace these legs of mine, and attempt to combine push with enjoyment. Hard experiences can cloud the reality of times that have passed, and I had an urge to blow these away. 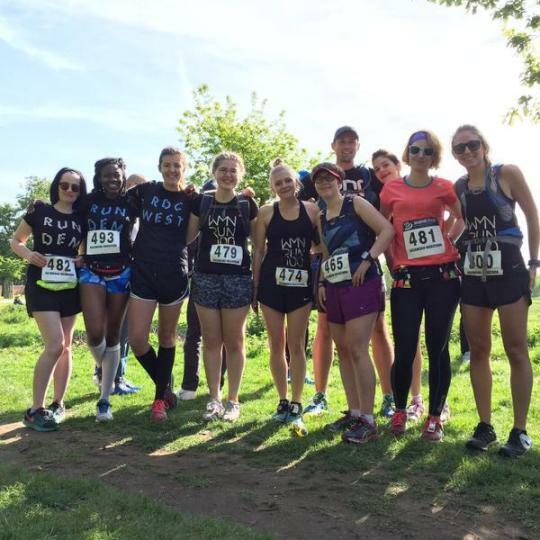 After learning that a few of the WMN RUN 100 ladies were already due to run this race, a few of us spoke of wanting to run it too, in the lead up to Race to the Stones. A spark was lit. I went home, contacted the organisers, and put forward those that wanted to take part. Signed up to our next marathon minus the apprehensive build up, with the last minute nature denying us of an onslaught of pre marathon doubt. Those who had never experienced this distance before were assured that their ultra training so far would be enough, that they could take it easy, at their own pace, and as a training run. Under a surprise lot of sunshine, good lucks were given, embraces were shared, the gun went, and we were off. All I wanted to do with this race was stay at the front, and try to maintain first lady. It was a rarity, but this aim didn’t consist of any times, paces or splits, and allowed me to regain the notion of why I love running. Realising that this isn’t to always feel like I’m killing myself off. That there is a happy medium in there somewhere. I ran the majority of the race with a gent called Edward; rambling as we went, talking when we wanted to, and despite the three killer ascents of Broomfield Hill, allowed ourselves to enjoy it. I crossed the finish line to first lady, grateful of the silver plate I received, but even more made up to see the staccato of achievement as of our ladies crossed the finish line. A Boston qualifier and a third place for Amelia (left), a multiple marathon for some, and a first experience for others. All this, and the first big marker for our project in the bag.